Designed in the 70s, Lordshill was carved out of woodland and given a good start, with communal gardens and mature trees. In recent years however, anti-social behaviour commandeered these public areas and so their landscaping had been forced to respond, with defensive spiky planting and brambles. 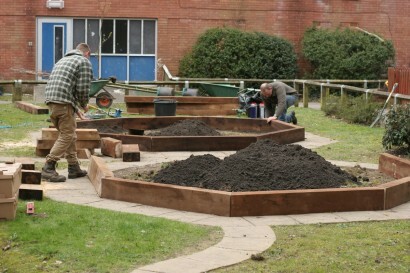 Spectrum’s Housing and Community Investment teams focussed their efforts on supporting the community back to better health and once some of the initial issues had been resolved, Arc were commissioned to help people reimagine their communal gardens as positive spaces once again. Resident consultation Spectrum-wide had identified a strong interest in urban wildlife, giving rise to Spectrum’s new ethos and project ‘Birds, Bees, Bats, Bugs’ (the 4Bs) and giving Arc the opportunity to introduce wildlife-friendly interventions – nectar and pollen-rich ‘edible’ planting choices, encouraging ‘nature nearby’ into the estate from the neighbouring conservation area by supplying food and habitat. 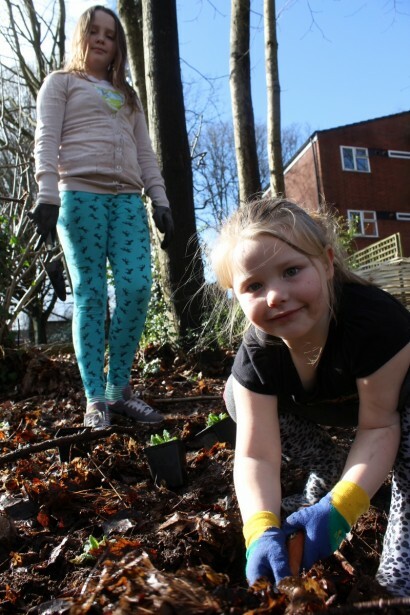 Native trees were planted by children from the estate to restore a wooded bank while a more formal approach in a second garden replaced redundant play equipment with raised lavender and rose beds. Simple native bird cherries and bee-friendly herbs were planted elsewhere to bring life, blossom and scent to communal entrances. An important part of the brief was for a nature-inspired sculpture or artwork. This gave us further scope to create another win for wildlife by looking at sculpture with a purpose, combining form with function, or in fact, art with ecology. Public artists, Eccleston George and Artecology were commissioned, creating a series of hand-sculpted, textured and each unique bird boxes. To celebrate all this, we held a second Wildplay day with each child choosing a tree for their bird box. This year again we returned for more ‘4Bs’ planting and to work with the children on a planting project to support local BAP species, the Silver-washed Fritillary. The enthusiasm and interest of all the people we meet on this project and the way that they explore and respond to their environment is a real inspiration for Arc, Spectrum and Artecology. The children and the wildlife they’re so keen to learn about are really what brings Lordshill’s green spaces to life. For us it’s all how we can make the experience of nature and biodiversity in even (or perhaps especially) the most urban environments, a source of improved well-being. Success has already been measured by Spectrum with residents’ satisfaction surveys showed a marked increased just a year in to the project. 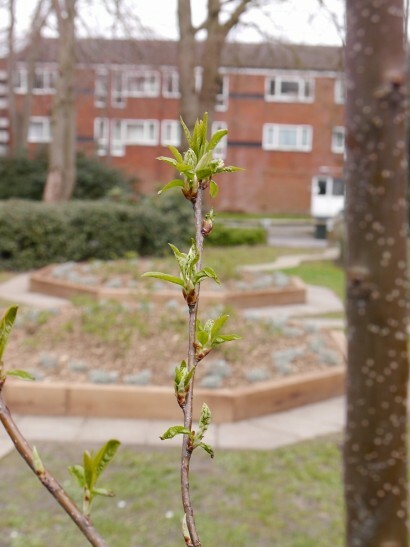 Our colleagues at Eccleston George, Artecology, Landscape Therapy and the landscape designer Philippa Lambert all joined Arc for the work, contributing to a project that has encouraged more residents to ask for similar treatment in their areas.